There is much more than meets the eye on this truly custom on-of-a-kind stair tower at Loyola Law School. 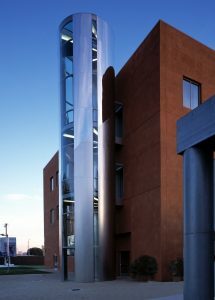 Designed by Gehry and Associates, the tower incorporates two different stainless steel finishes (polished and angel hair) on the exterior and several types of metal on the interior. Ceiling and floor stainless steel diamond plate was notched, bent, shimmed and laser-cut in custom designed shapes. Interior galvanized metal panels matched the same lapping design of the exterior stainless steel. Every gap between ceiling and wall plates was held to an 1/8" or less tolerance. A relatively small project, but - as befitting Frank Gehry - one that exhibits the same high quality of design and metal craftsmanship as seen on his world-famous buildings.